Cobb was born on December 18, 1886 in rural Georgia to a local state senator. Fascinated by baseball from the time he was a boy, he began playing organized baseball as a teenager for various semi-pro teams. In 1905, one of these teams sold his rights to the Detroit Tigers for $750, which propelled him into the Major Leagues. Before he made his MLB debut, his family was hit with tragedy. His mother fatally shot his father and was charged with murder. His father insisted that it was an accident and was acquitted of the crime, but the incident did affect him. Ty later said that this caused him to play baseball in a way that would make his family proud of him. It was clear early on in his career that he was a special player. In 1906, in his second year playing for the Tigers, 19-year-old Cobb became the starting center fielder and hit .316. Cobb would never again hit below this number. In the following year, he would lead the Tigers to the first of three straight American League pennants. During his 22-year career with the Tigers, Cobb won a record 12 American League batting titles, including 9 in a row from 1907 to 1915, along 4 RBI titles. He also won a triple crown in 1909 and the AL MVP in 1911. Cobb was further one of the best base stealers the game. He led the league steals 6 times during his years with the Tigers and famously stole all 4 bases on 5 different occasions. 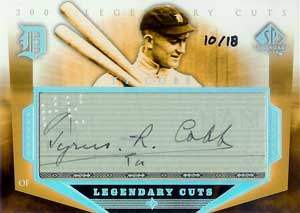 Among the many records Cobb set during his playing days were for the most hits: 4,191 (which lasted nearly 60 years), and his lifetime batting average of .366 is still the highest and unlikely to ever be broken. He also still holds the record for most combined runs and RBIs: 4,065. During his last 6 years with the Tigers, Cobb was also the manager of the team. He finished his career with the Philadelphia Athletics , playing two years with the club before retiring in 1928. The Baseball Hall of Fame opened in 1936 and Cobb was elected during this class to be part of the inaugural year. Other players in his class included Babe Ruth , Christy Mathewson , Honus Wagner and Walter Johnson . Cobb received 222 of 226 votes. This was the highest number of votes for that year. Ty Cobb made a big mark on the Major League Baseball. He was one of the game’s greatest hitters and base stealers, and his legacy lives on nearly a hundred years after he retired. He even still holds two of the records that he set during his time as a player.